Sai Tai Mai bus station is Bangkok’s Southern bus terminal and Bangkok’s second busiest bus station. Sai Tai Mai is one of three major bus stations in Bangkok. 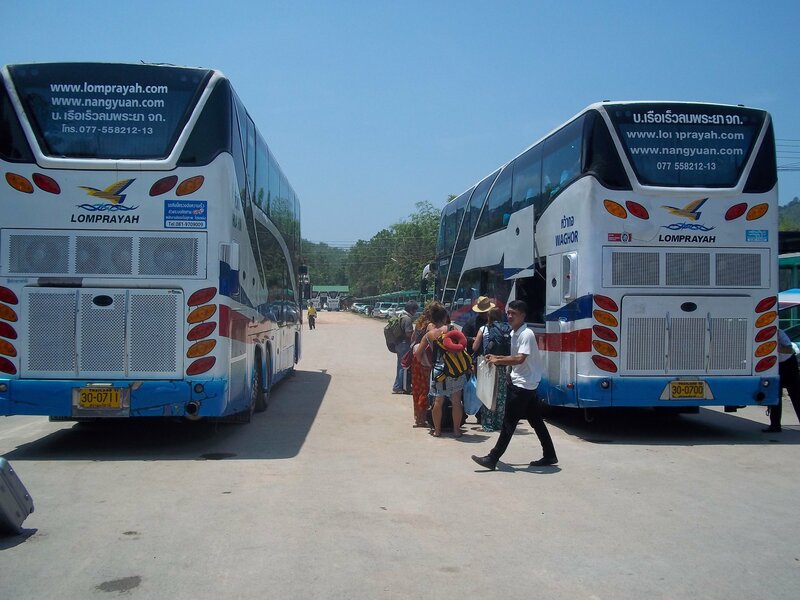 Bus services to destinations in the South and West of Thailand depart from Sai Tai Mai bus station. Bus services to the East of Thailand depart from Ekkamai bus station. Bus services to the North of Thailand depart from Morchit bus station, which is Bangkok’s Northern bus terminal. 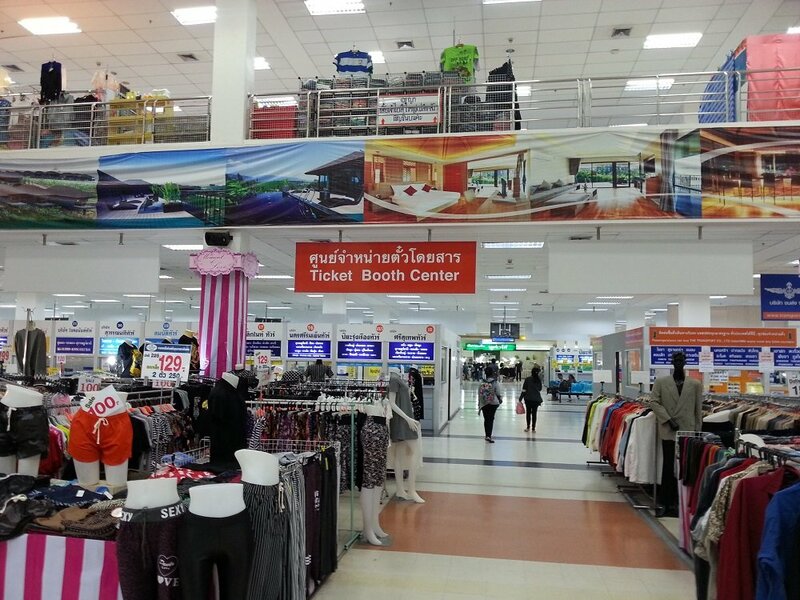 There are a wide range of facilities available at Sai Tai Mai Bus Station. In addition to these there is a large shopping centre above the bus station. The shopping centre is air-conditioned and many bus passengers choose to wait inside the shopping centre rather than in the bus station itself. Food stalls with seating in the main station building. SC Plaza shopping centre is next door to Sai Tai Main bus station. The bus station is connected to SC Plaza by an internal staircase at the far end of the main bus station building. Two 7-Eleven convenience stores: one in the main station building and another by the bus departure platforms. Toilets in the main station building and another near the bus departure platforms. There are two different places to buy tickets at Sai Tai Mai Bus Station depending upon whether you want to buy bus tickets or minivan tickets. Bus tickets are sold on the 2nd Floor of the SC Plaza. SC Plaza is the shopping centre adjacent to the bus terminal. There are several entrances to the SC Plaza and it does not matter which one you use. Take the escalator to the 2nd Floor and follow the sign which reads ‘Buy Bus Tickets’. The ticket counters are in the centre of the 2nd Floor. The SC Plaza has a number of shops, free toilets and a food court. This is a better place to wait for your bus and to eat than the bus terminal itself as it is air-conditioned and there is comfortable seating. Minivan tickets are sold at the outside booking counters in front of the bus terminal building. Minivan services tend to be frequent and run to less of a fixed schedule with several operators doing the same journey. If you plan to buy a minivan ticket on arrival at the station go to the row of ticket counters and tell one of the minivan ticket sales people where you want to go. They will direct you to the correct counter for next departure. The system appears a little chaotic but you will get where you want to go even if you need to wait a little while for the next available seat in a minivan. To Buy bus tickets from the Southern Bus Terminal to destinations including Chumphon, Koh Samui, Koh Phangan, Krabi and Phuket use the Search Box below to book. By road Sai Tai Mai bus station is 22.9 km from Siam Square in the centre of Bangkok. There are two ways to reach Sai Tai Mai bus station from central Bangkok. Taxi. A meter taxi should cost 150 THB to 200 THB for journeys from most parts of Central Bangkok to the Southern Bus Terminal. Allow up to 90 minutes for the journey depending on the time of day and the traffic. BTS/Taxi. Travel by the BTS system to Bang Wa BTS station and take a taxi from there. The taxi journey from Bang Wa BTS station to Sai Tai Mai bus station takes around 15 to 20 minutes and 80 THB to 100 THB on the meter. Bang Wa BTS station is the closest station on Bangkok’s elevated train network, known locally as the skytrain. There are lots of meter taxis waiting for passengers outside this BTS station as many people follow this route everyday to get to Sai Tai Mai bus station. Taxi: Take a taxi from the Airport to the Southern Bus Terminal. On the meter, including tolls and airport surcharge, it should cost around 400 THB and take between 50 and 60 minutes. Airport Railway link/BTS/Taxi. The journey starts by the taking the Airport Railway Link service from the Airport to Makkasan Airport Link Station. 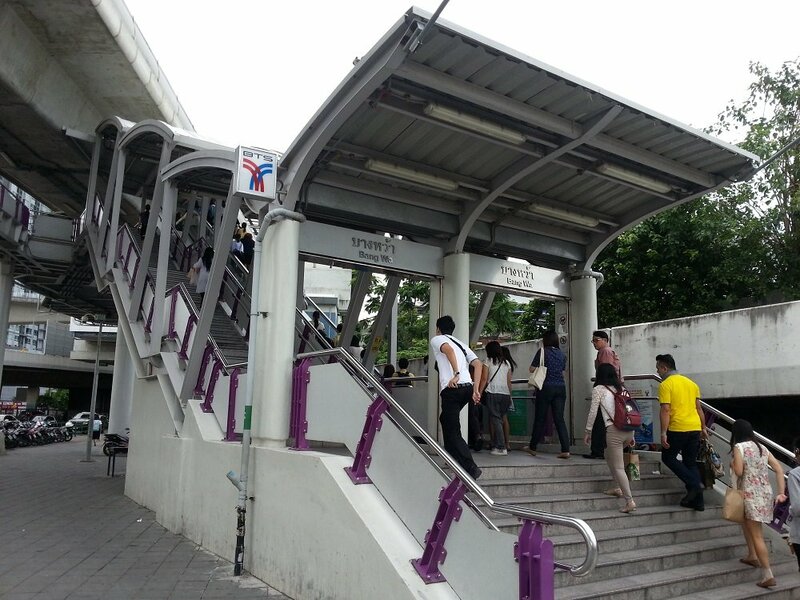 At Makkasan leave the Airport Link train and walk to Phetchaburi MRT (subway) station. There is a bridge connecting the two stations. From Phetchaburi MRT station travel five stops to Silom MRT station. At Silom MRT station leave the metro system and walk to the adjacent Sala Daeng BTS where you take the Silom Line for 9 stops until you get to Bang Wa BTS station. 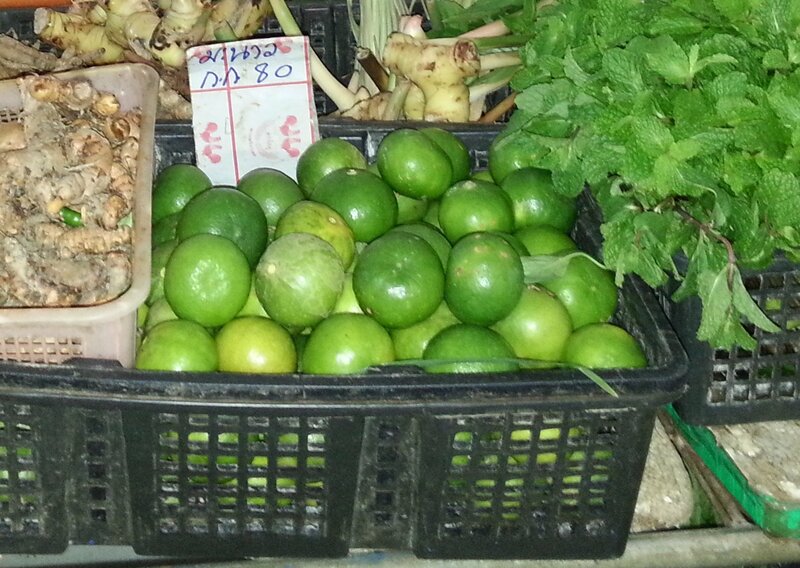 From Bang Wa BTS you then need to take a taxi to Sai Tai Mai bus station. The taxi journey should take 15 minutes and cost from 90 THB to 100 THB on the meter. Bus. To save money you can take the Airport Shuttle Bus #556 from Suvarnabhumi Airport to Sai Tai Mai Bus station via Democracy Monument. This journey costs only 35 THB but can take 90 minutes to 2 hours depending on the traffic. Airport Shuttle Bus # 556 departs from the Public Transport centre at Suvarnabhumi Airport, a short walk away from the main terminal building. Taxi. On the meter, including tolls and airport surcharge, it should cost around 350 THB and take about 40 to 50 minutes to travel from Don Mueang Airport to Sai Tai Mai Bus Station. Bus/BTS/Taxi. Take the shuttle bus on the A1 route from Don Muaeng Airport to direct to Mo Chit BTS station (the bus journey cost 35 THB and takes 20 to 30 minutes) and travel to Bang Wa BTS station (the BTS journey takes 45 minutes and costs 52 THB). From there take a meter taxi to the Southern Bus Terminal (a taxi journey of 15 minutes and 90 THB to 100 THB on the meter). Total cost of 185 THB per person and a journey time of 90 minutes. Bus. Take the shuttle bus on the A1 route from Don Muaeng Airport to direct to Mo Chit BTS station. From there there are four bus routes which go to the Southern Bus Terminal: 28, 159, 177 and 524. The journey should cost a total of 60 THB and take around 2 hours to 2 hours 30 minutes. 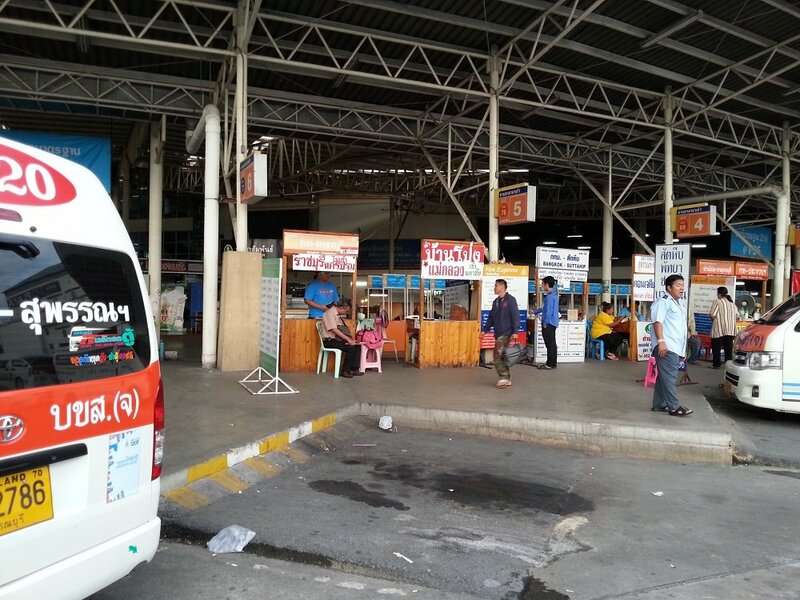 From Southern Bus Terminal there are departures to travel directly to most destinations in the South of Thailand. The bus route from Sai Tai Mai is particularly popular for the journey to the West Coast of Thailand (Andaman) particularly Phuket and Krabi which are not on the train line. For a cheap way to reach the deep South of Thailand heading towards the border with Malaysia there are budget buses leaving throughout the day from Sai Tai Mai. A bus from Sai Tai Mai to Chumphon is the cheapest way to travel from Bangkok to catch the connecting ferry to Koh Tao. This service is provided Suwannatee Tour Company whose air-conditioned bus services usually from depart from platforms 47-48. The arrival point is Chumphon Suwannatee Bus station which is 1.1 km from Chumphon train station. Cost: 373 THB per person. Journey Time: The journey takes around 6 hours 30 minutes. Minivan: You can also book a joint minivan and ferry ticket from Suwannatee Bus station to Koh Tao. he VIP bus has fewer seats then the Express bus which means that the ones there are recline further back making it easier to sleep. The arrival point is Krabi bus station. For onward travel to the beaches of Ao Nang, Railay and Ao Luek travel the 2 km into Krabi town by shared or private taxi and take one of the cheap and frequent shared taxis from there. Journey Time: The journey takes 12 to 13 hours. The arrival point for bus services from Sai Tai Mai bus station to Phuket is Phuket Bus Terminal 2. 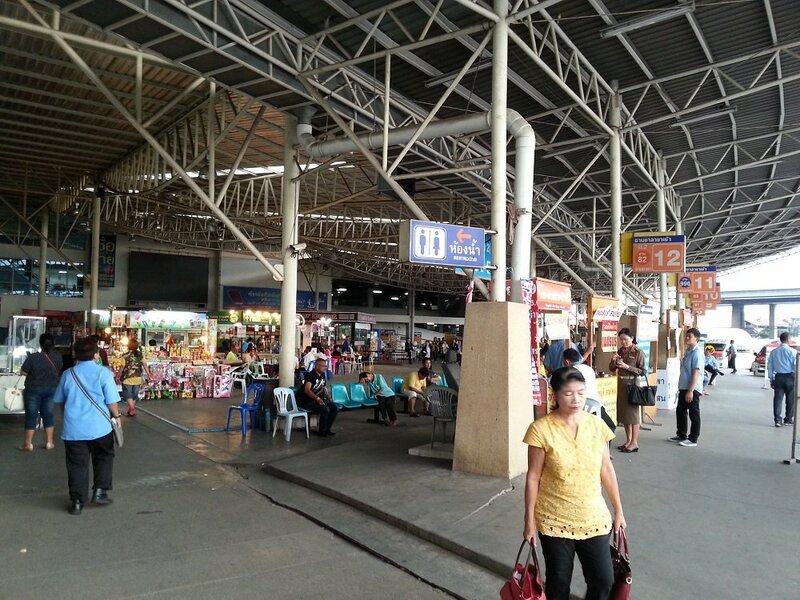 This is the main bus station for the island of Phuket located some 4 km from Phuket Town. There are many cheap shared taxis and minivans going to all destinations on Phuket directly from the bus station. Journey Time: The journey by bus takes 13 to 14 hours. 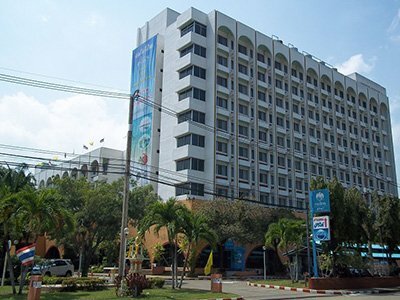 The Komol Residence is the closest hotel to Sai Tai Mai bus station.